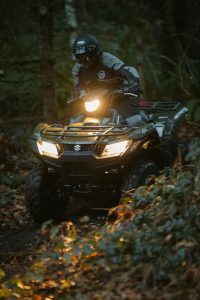 The 2019 Suzuki KingQuad 750AXi is revealed. 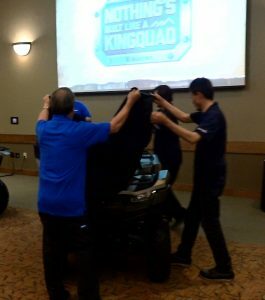 It wasn’t the all-new KingQuad I predicted, but it is indeed the best KingQuad Suzuki has ever released. Suzuki somehow let a decade pass without offering a new ATV, so when I got word that they had something they wanted me to ride I was very excited. I had a theory, how could they take this much time and not release an all-new product that really turned heads? After all, Suzuki invented the 4-wheeled ATV with their 1983 QuadRunner 125, created the first youth ATV with their 1984 LT50, launched the first two-stroke four-wheeler with their QuadRacer 250 and in 1987 created a 4×4 utility ATV game-changer with the industry’s first independent rear suspended ATV, the QuadRunner LT4WD (which later in 1991 took the the iconic KingQuad nomenclature). As much as I love the LT-R 450 and wish Suzuki would bring it back, I was pretty confident that the new machine wouldn’t be a sport quad, I figured it would wear the KingQuad 4×4 badge. So, what did Suzuki have up its sleeve after all these years? Would Suzuki be the first of the Big Four to offer a Big Bore twin cylinder and go after Can-Am and Polaris? 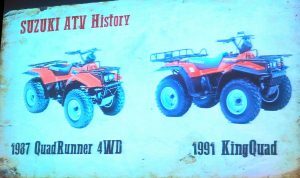 I checked, Can-Am and Polaris have been doing quite well over the years with their 850 and 1000 powerful 4×4 ATVs, so I had visions of a twin cylinder 850cc KingQuad. 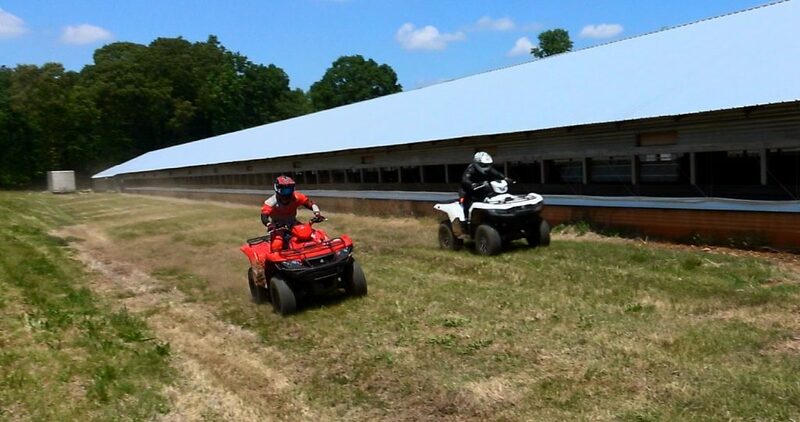 The KingQuad is one of the most iconic ATVs in our industry. In my opinion, a powerful 4×4 wearing the mighty KingQuad badge from Suzuki, (one of the most reliable ATV manufacturers in the world) would be a HUGE hit for the brand. I know many say it’s unrealistic to think that any of the Japanese manufacturers would release such an ATV, but I have to admit I really thought it was going to happen, and I figured there wasn’t a better machine for it to happen to than the almighty Suzuki KingQuad. Since I’m not the decision-maker over at Suzuki, we will have to settle for a revised KingQuad 750, at least for now. It’s a good thing for Suzuki – the old KingQuad was made exceptionally well from the beginning. It was an inviting scene, 20-some KingQuads ready to rip at Joe Gibbs Racing’s private testing facility. For model year 2019, while the KingQuad hasn’t been totally re-done, the revisions made have indeed improved the machine. 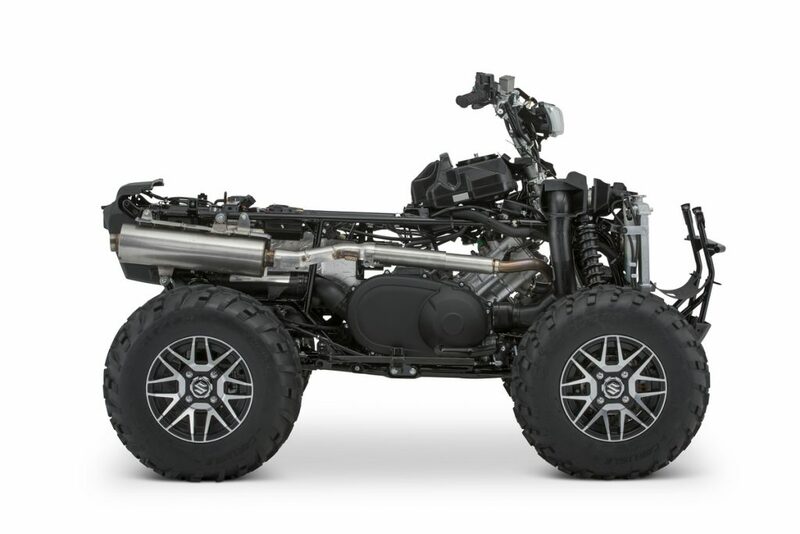 I would have liked to have seen a new-from-the-ground-up approach like Yamaha did with its Grizzly in 2016, but like I said, it’s a good thing the KingQuad was already a very well-made machine from the start. 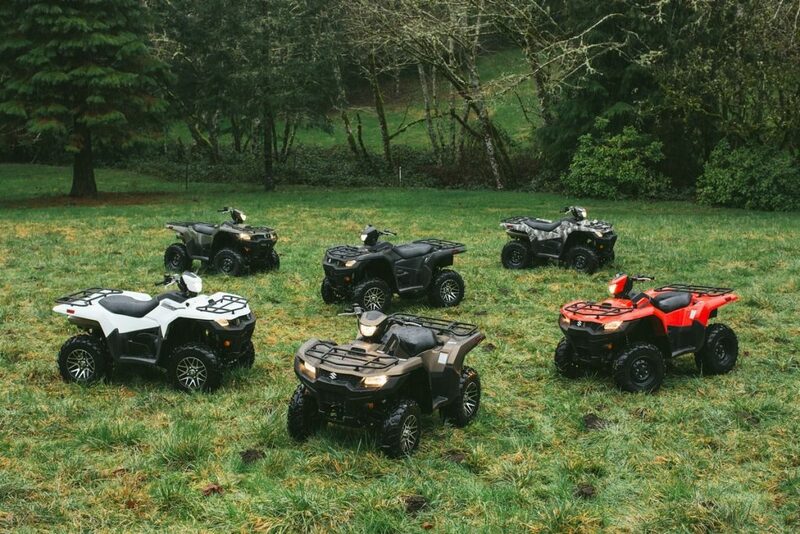 With the President of American Suzuki and several of the KingQuad engineers and developers present, I knew they must be pretty serious and proud of their 2019 entry, after all the KingQuad 400, 500 and 750 make up Suzuki’s entire adult-sized lineup. Their old motto, “Nothing’s built like a KingQuad” came to mind as the new improvements were being explained to myself and a dozen or so other members of the media. Okay, pretty much the same 722cc fuel-injected engine is used along with Suzuki’s exceptionally well-built Quadmatic CVT transmission system. The engine is slightly updated with a bigger oil pump to help increase oil flow and to supply a new piston oil jet system, which should improve the already outstanding durability that you can count on with a KindQuad purchase. The CVT has been carefully tuned with different clutch package weights that provide slightly better acceleration and improved engine-braking compared to previous models. These clutch mods also aid in the increased towing capacity, (more on that later). The KingQuad has never looked better! 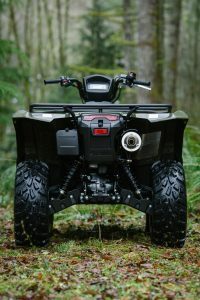 The first thing you’ll notice on the newly revised KingQuad is the new good-looking bodywork, which includes an aggressive-looking new front end and high-clearance fenders with revised panels that simplify fueling, checking the engine oil and allow you to easily get at the KingQuad’s air and fuel filters. Removing the seat and getting to maintenance items is extremely well-done, this machine just might be the easiest 4×4 ATV to maintain than any. The same frame and geometry is continued but the frame is updated with thicker main tube frame members and redesigned brackets in key areas. This along with a new and improved two-inch receiver allows the machine to tow an impressive 1332 pounds (up from 900lbs). Revisions have been made to the fuel-injection system and updates were made to meet stricter emissions guidelines. The new KingQuad features four new gas-charged shocks that are 5-way pre-load adjustable to match the spring rate to the cargo load. The actual size of the shock body and the internal valving has been increased. The same wheel travel is maintained; 6.7” in the front and 7.7” in the rear. A much thicker and stronger stabilizer bar with improved bushings helps the 47.8“ wide machine feel planted when cornering. We were told that the new KingQuad was upgraded to a higher output electronic power steering system that is said to allow slow-speed maneuverability to be 30% easier, but steering felt about the same as older KingQuad models in my opinion. Slight changes to the handlebars make for more relaxed ergonomics. My personal favorite is the KingQuad 750AXi SE in white. This version adds power steering and aluminum wheels. The new LED rear tail light that blends into the new storage compartment makes the rear of the 2019 KingQuad look as sharp as its front. Duel hydraulic disc brakes have new brake pad material and an improved lever ratio for better front braking than previous models. The sealed multi-plate rear braking system features a new foot brake lever ratio as well, but the foot brake doesn’t seem to lock up the rears as well as the handlebar lever on the left side of the bars does. All in all, braking was noticeably better up front and about the same in the rear. Braking is displayed with a new bright LED rear brake light, which is also new for model year 2019. A very well-done display panel is new for 2019. It has been fully redesigned with a bigger more pronounced font that helps to improve visibility. The new unit is now able to provide service reminders based on running time or mileage. 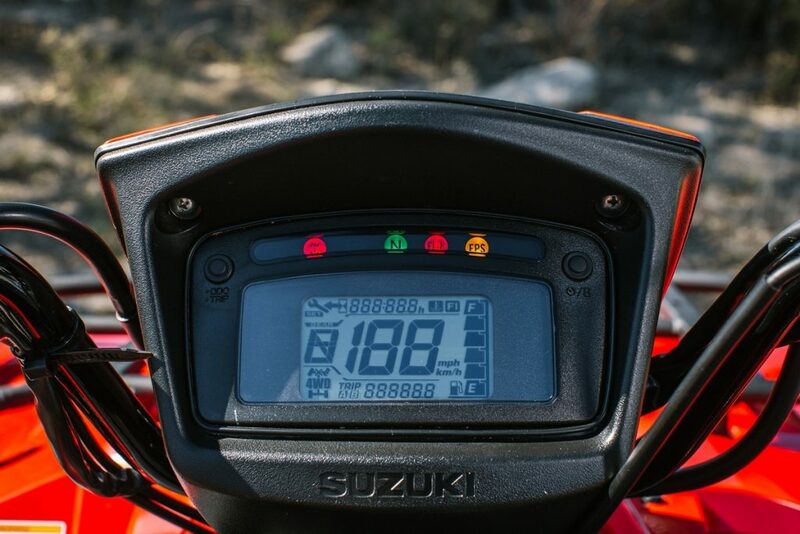 The instrumentation includes LCD readouts for speedometer, odometer, twin trip-meter, hour meter, clock, fuel level, driving range and drive mode. LED indicators for high, low, neutral, reverse and 2WD/4WD and differential-locked 4WD. LED cautions for fuel injection and engine temperature. The display is one of the best I’ve seen on an ATV. Storage capacity on the revised KingQuad is impressive. A new 4.0 liter compartment has been added below the tail light, while the same 4.0 liter compartment on the left is still available, as is the 2.8 liter water-resistant front compartment, and thankfully Suzuki’s excellent scratch resistance steel-tube cargo racks are maintained. 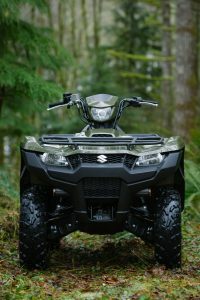 Since the KingQuad is Suzuki’s only adult-sized ATV/UTV entry and hasn’t received a complete make-over since 2005, I was predicting Suzuki would have advanced the KingQuad into more of a performer than it is. I personally feel that Suzuki needed to really wow the industry and show that they are back with vengeance, it was time if you ask me. As I said, I would have liked to have seen an 850cc machine in an all-new cutting-edge chassis. 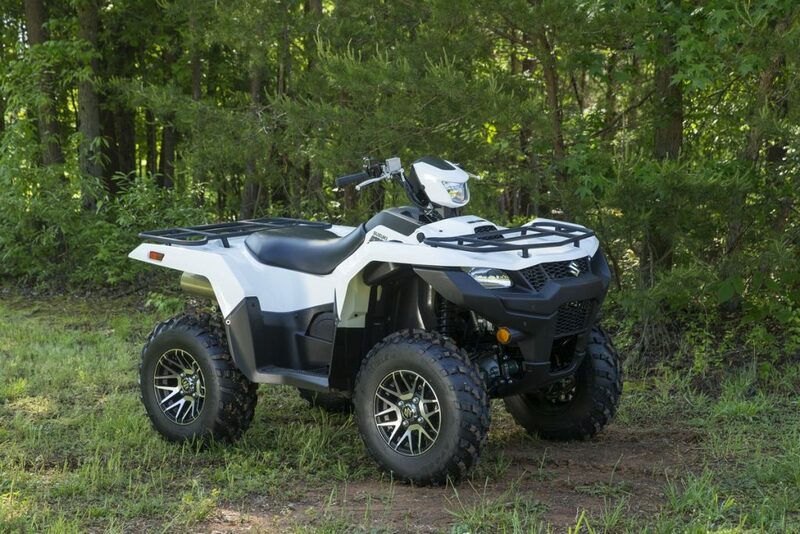 Or at least a completely new-from-the-ground up KingQuad 750 (similar to what Yamaha did with its all-new Grizzly in 2016). 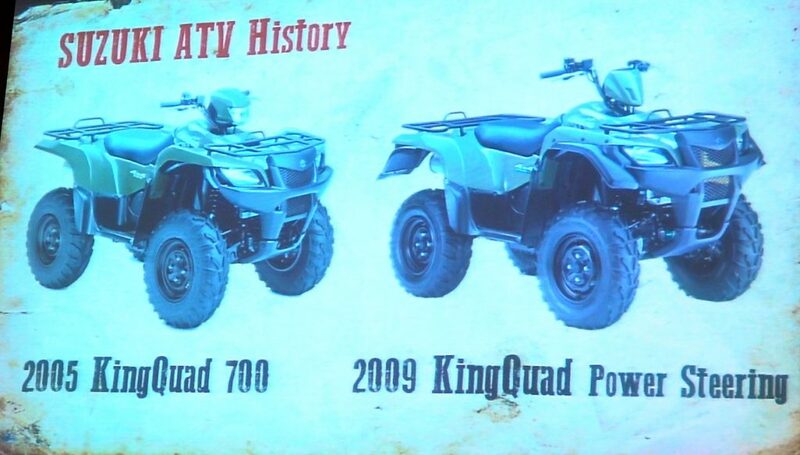 While other 4×4 ATVs have advanced greatly, the KingQuad is only slightly better than previous models. No, I didn’t clear any of the doubles or table tops on JGR’s Supercross practice track, but it was an honor just to ride on the same dirt that JGR professional motocross stars practice on. The natural motocross track in the back was even cooler than this! As a member of the media I was invited to ride test the new 2019 Suzuki KingQuad 750 AXi in the Charlotte, NC area at the Joe Gibbs Racing facility where the JGR motocross team tests and practices. Jeremy Albrecht and the guys at JGR cut some trails on the property for us. The terrain included a rock and log section, a river crossing, some tight wooded trails and they even let us ride on some of their motocross track. I was able to put about three hours of seat time on the machine. I utilize every second possible at a ride intro and tend to give a machine I’m testing a little more of a workout than most editors do. So, I didn’t cut the KingQuad any slack and rode it pretty hard. Suzuki is a big part of the JGR Motocross team, with this we were treated to a special tour of the JGR facility in Huntersville, NC. What an incredible place and effort being put forth by Joe Gibbs and the over 400 employees! 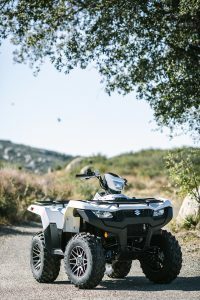 With its bigger gas-charged 5-way adjustable shocks the 2019 KingQuad is extra plush and provides a very smooth ride. The first thing I noticed was the new 5-way pre-load adjustable gas-charged shocks. The KingQuad has a smooth Cadillac-like ride that most people will really like. If you’re an aggressive rider you will want to stiffen them up as I was able to bottom the machine in hard riding situations. Suzuki had a 2018 KingQuad 750 AXi on hand so I took advantage of the opportunity to ride it. The improved shocks paired with the revised sway bar and changes to the power steering seemed to combine for a slightly better ride on the new 2019 model. The new KQ seemed to feel a little more planted and easier to corner on. I didn’t feel much improvement in the power delivery, so since we had access to their 2018 unit I teamed up with DirtWheels editor Collin Duffy (who is about the same weight as me) and we drag raced the two machines. Sure enough, Suzuki was right, the new KQ came alive out of the hole just a tad better but it was ever-so-slight and hard to detect, and after several attempts and switching riders most every drag race with the older model ended in a tie. We drag raced the 2018 KingQuad. The 2019 had a slightly better throttle response but most races ended in a tie. Suzuki claims they “re-calibrated the front end geometry”. It does handle better, I did not experience any bump steer or “turn-in” issues like I have with past KingQuad models. 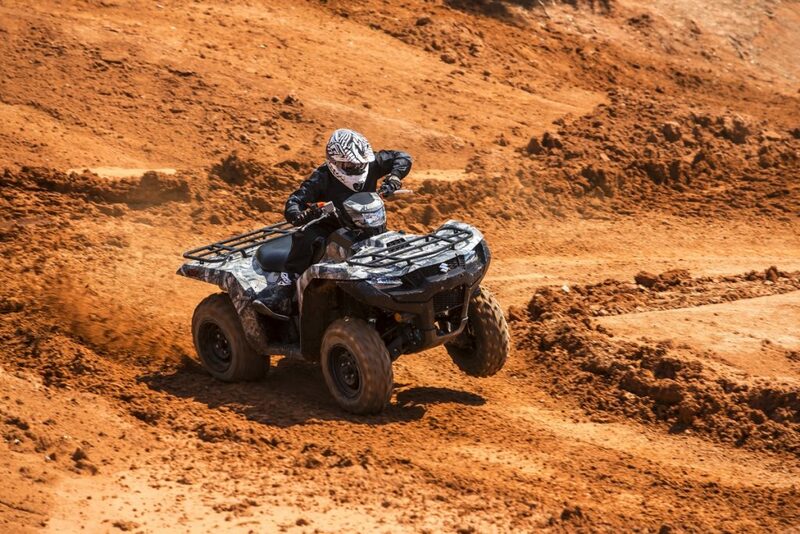 Since the 2019 KingQuad 750 Axi is very similar to older units I wont cover a lot of the details, you can simple search KingQuad in our search bar and find several features to learn more about this iconic ATV and how we’ve modified KingQuads for aggressive riding and even racing. If you’re a KingQuad loyalist you may be curious if Suzuki fixed the pesky bump steer problem that is also referred to as “Turn-In” issue. With previous KingQuad models, unexpectedly, especially while aggressively riding down hill, while hitting a bump the bars can go from straight to a full lock left or right turn in milliseconds and this can yank the bars from your arms which usually leads to an over-the-bars crash. This was mainly a factor in non-power steering units as EPS models were equipped with a little more positive caster (3.3 degrees to be exact). To explain this a little better, it has been proven that the upper ball joint should be about 4-6 degrees behind the lower ball joint for optimal steering control and feel. The less positive caster you have the quicker the machine will steer, while this is great for slow speed ease of turning it comes at a price as the machine can feel a bit twitchy at high speeds. For 2019 Suzuki updated the power steering system and Suzuki engineers told us that they “re-calibrated the front end geometry” to make the machine steer better in all situations. I was unable to get exact details as to what was changed. I don’t think positive caster has been increased on the new KingQuad, but I did experience a better steering feel than I did on the older version. Special thank yous to Ken Robey and his son Doug Robey for helping me properly evaluate the 2019 KingQuad. Click the video above for their input. 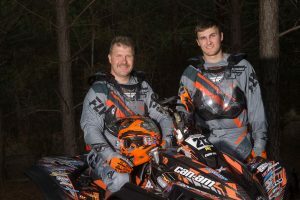 I put about three hours of seat time on the new KingQuad in North Carolina then took the machine to Ohio and put it in the hands of two carefully chosen test riders, Ken Robey and his son Doug Robey. 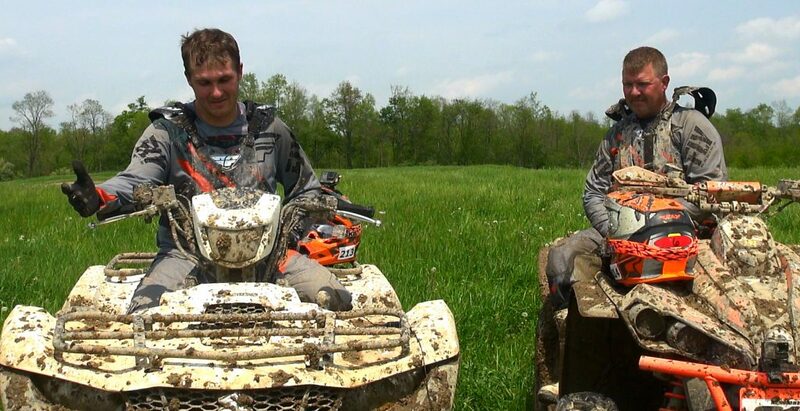 Ken and Doug are two of the most knowledgeable 4×4 ATV guys I know – they’re also extremely accomplished 4×4 ATV racers, Ken has won a couple GNCC National Championships and Doug recently scored his first 4×4 Pro podium finish. I’m happy to say, neither myself, Ken or Doug could recreate the old bump steer issue with the new 2019 KingQuad. Check out the video above for all three of our opinions of how the new 2019 KingQuad performed. In the video above Ken and Doug explain who the KingQuad is meant for and what they would like to see in future models. Ergonomics are great, as they’ve always been on a KingQuad. And Suzuki brought back the handlebar mounted headlight for model year 2019. I would have liked better rear brakes. The same maintenance free multi-disc sealed rear brake is used instead of hydraulic disc brakes. Unless you’re an aggressive rider this wont be too much of an issue. And the reason this kind of brake system is used is because it allows maintenance-free braking for the life of the machine, so in this case my con just may be your pro – just know going in that your rear brake stopping power will only be mediocre. I really like the foot-peg location and full metal motocross-style pegs on the KingQuad. What’s more, there’s little chance you’re going to slip off of the plastic floorboards thanks to very well-designed serrated step on plate that runs the entire length of the floorboards. Moving around on the machine is never an issue thanks to Suzuki’s tried and true T-shaped seat and carefully crafted front and rear fenders. Handlebars and controls are also well placed. The new 2019 bars are very slightly taller than older models. Neither myself, Ken or Doug had any complaints on the ergonomics, and after plenty of riding none of us had any aches, pains, strange blisters or sore knees. A Flame Red or Terra Green (pictured here) non-power steering edition is available, but don’t be tempted – you will regret non having power steering. The KingQuad needs power steering more than any ATV I’ve ever ridden. All in all, I would have liked to have seen a new from the ground up effort out of Suzuki, but at the same time, the tried and true KingQuad still scores well with me. It’s not like we have to settle for a sub-par machine until they can finally release something that works well, it’s quite the opposite, the KingQuad with its revisions from year to year still offers one of the best 4×4 utility choices in the industry. 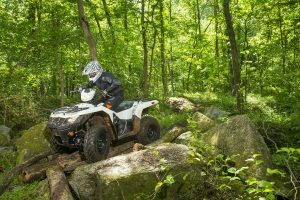 And perhaps the best reason to consider the Suzuki KingQuad as your next ATV comes from the many current owners that proudly explain all the years of trouble-free dependable ownership they’ve enjoyed by owning a KingQuad. The smaller KingQuad 500 AXi has received the same revisions, the only difference is the 500 is powered by Suzuki’s 493cc fuel-injected four-valve engine. 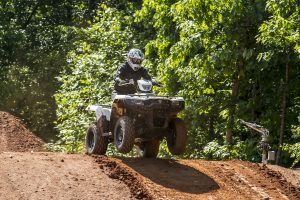 The KingQuad 400, powered with a fuel-injected 376cc four-stroke, four-valve engine, remains as the third and final member of Suzuki’s adult-sized ATV lineup. 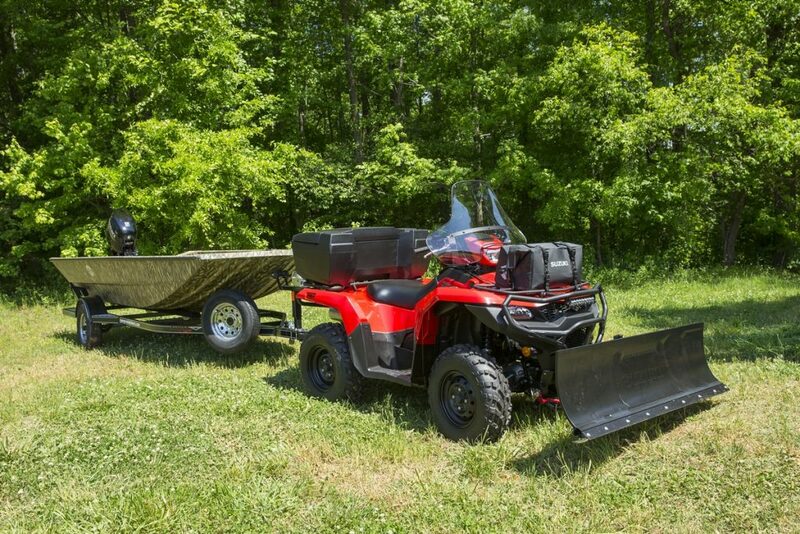 The 2019 base model KingQuad 750AXi does NOT include power steering and comes with steel wheels, it’s available in either Flame Red or Terra Green and has an MSRP of $8,799. 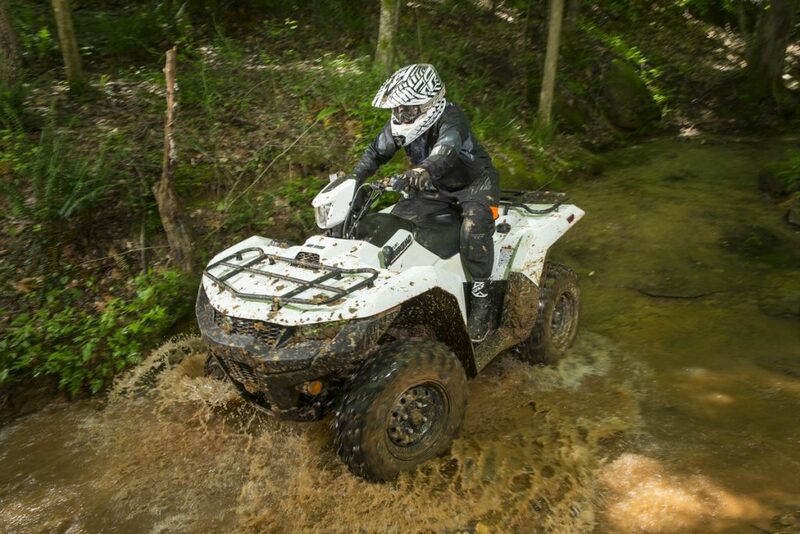 The KingQuad that we tested was the white 2019 KingQuad 750AXi SE. This Special Edition unit adds power steering and cast aluminum wheels and retails for $9,899. The SE+ model adds a Matte Black or Bronze color and retails for $10,299. Every KingQuad model is EPA emissions compliant, and California models are eligible for Green-sticker off-road registration. All three KingQuads and their engines are assembled with pride in America at the Suzuki manufacturing facility in Rome, Georgia. We were told Suzuki has increased accessory availability with ten new items. A 12-month limited warranty is included but with Suzuki dependability I doubt you’ll have any issues.